My New Heartbeat: She has a face! You may read that title and think 'Whoa! What kind of Hannibal Lector stuff is happening in your world where your baby WOULDN'T have a face?" But I'm simply going to detail how today my daughter's image went from a fingerprint smudge on a cell phone, to an alien's skull X-ray to a beautiful baby. We had a great visit to the OB this morning to look at little girl's heart. Last time she was all twisted up and the tech just couldn't get a good view. This time, we could see it beating perfectly. Very glad to hear the happy/healthy conclusion each time. Matt had to work so he unfortunately missed the ultrasound, but my friend Erica was awesome enought to wake up at 8 a.m. and get me to the doctor. She got to witness the amazing moment where I got a good look at my daughter's face for the first time. The 3-D sonograms are pretty freaky at first. When the baby is so small you can't make out any features, your child just looks like a peanut, or a worm, or a charchoal sketch a five-year-old make with his toes. 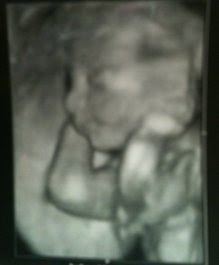 But now, at 23 weeks along, the 3-D image was incredible. I see her nose. It looks like Matt's. I see her mouth moving non-stop. It's like mine. I know that she will drastically change over the next 17 weeks and then even more over the rest of her life. But to see a glimpse of something as simple as that nose, that part of her face that she may hate or love, that part that may make her think of me or Matt when she looks in the mirror, that part that makes other people say "Oh, she looks like you," and "She has your nose."